Latest Update 2: Linking in the Notifications and Manage Workflow blogs, and the SAP Fiori for S/4HANA wiki. Latest Update: There is a variation on Intent-based Navigation – if you are navigating to another Fiori (SAPUI5) Application deployed on the same Fiori Frontend Server, you can embed the target app directly into the Task Detail – see SAP Note 2305401 – Integration of SAPUI5 Fiori Applications into My Inbox 2.0 for details. Having activated Fiori My Inbox as described in Leading S/4HANA UX – Fiori My Inbox – Part 1 – Activation you will need to understand the configuration and extensions for tasks. Each task type can use the option that best fits the need of that task, whether it’s Approving a Purchase Order, Releasing an Invoice, or responding to an Environmental Health and Safety safety observation. The move towards greater metadata driven development in Fiori and the single Fiori archetype in S/4HANA brings all sorts of exciting benefits for scaling S/4AHANA Fiori apps, including Fiori My Inbox. However if you have used Fiori My Inbox in SAP Business Suite or Suite on HANA, rest assured earlier options for configuring and extending My Inbox are still supported. And just as before, Fiori My Inbox supports both SAP delivered and custom workflows out of the box with a default implementation. However there are some significant benefits to be achieved by tailoring tasks – especially when it comes to mobile devices. Tip: Some of the extension options are covered in more depth the Fiori My Inbox wiki. Task-specific configuration and extension options are particularly critical when we intend to use Fiori My Inbox on mobile devices. While Fiori My Inbox app itself will operate on multiple devices, how the task-specific behaviour has been configured determines whether that particular task can be viewed and actioned on the device in question. Fortunately easy configuration is provided to control which devices can view which tasks. This avoids users becoming frustrated by being presented with related work items of a task they can’t action on their current device. Whether we are including standard or custom workflows the steps are much the same. By default Fiori My Inbox selects all work items for that user relevant to the user’s current device type from the configured workflow providers. NOTE: It is possible to filter the task gateway to only select configured tasks in the IMG (transaction SPRO). Just remember that this affects all your My Inbox tiles. You can deactivate the task filter again if you need to do so later. The newest option – currently only available in S/4HANA 1610 – is to extend the task specific details using an annotations XML file. This option works on all device types. These are currently provided for certain standard workflows as part of the S/4HANA 1610 install. On the Fiori Roadmap is the intention to support this option for custom workflows also. We know if this option is being used when there is an “My Inbox Generic Application” entry (technically visualization type INBOX_GEN) configured for the task id in Task Visualization (transaction SWFVISU) in the S/4HANA Core system. The quickest and easiest way to add task specific is to use the configuration options for Custom Attributes and Decision Options. Using the Custom Attributes we can add custom information to the task detail shown in the inbox for a particular work item. The blog Embellishing Your Approvals Without Coding describes how. This works exactly the same way as in earlier releases of Fiori My Inbox and the process is described in the blog Fiori My Inbox – Adding Action Buttons. In fact if the task is a User Decision, the action buttons will already be configured for us and will operate without any further action needed. Tip: If you display a workflow’s flowchart in the Workflow Builder (transaction SWDD) a user decision task will have the following symbol. 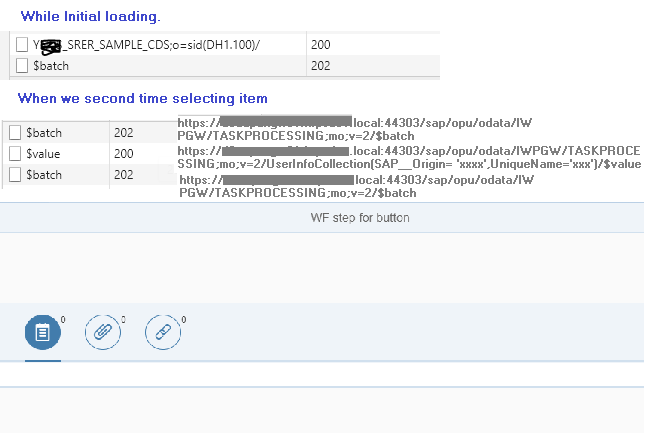 If the task is not a user decision task, then as per previous releases of Fiori My Inbox we can match our configured buttons with a background action by implementing the BADI /IWWRK/BADI_WF_BEFORE_UPD_IB. NOTE: To use this option, we first need to identify an API that can perform the action we need in background. It doesn’t matter whether the API is a BAPI (enterprise service), class method, or function module – it just needs to work and to be able to be called from within the ABAP system. 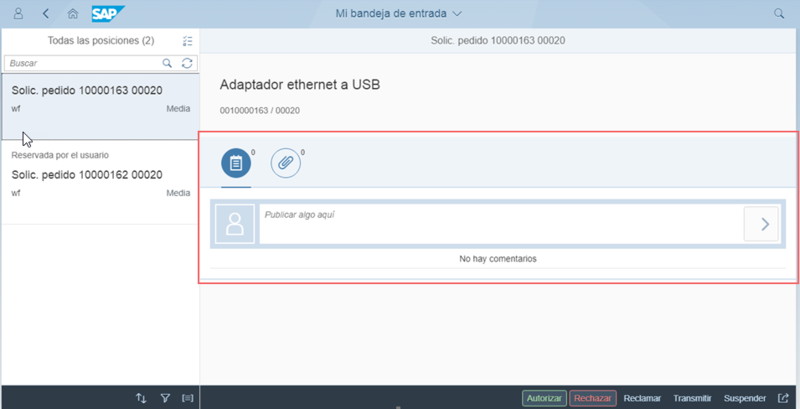 An example of how to do this is shown in the blog Fiori My Inbox – Implement the BADI for Updating the Decision. We can also view examples from S/4HANA My Inbox sub apps that use this option and deliver a working implementation for this BADI. For example, enhancement implementation MM_PUR_PO_APPROVE_ACTIONS provided for Purchase Order approvals via workflow WS20000075. When we want to launch the user from the work item to a different user interface we can use intent-based navigation. IMPORTANT: This option may not work on all device types, i.e. the task specific details will be displayed but it may not be possible to launch the navigation target on mobile devices. In particular, SAPGUI for HTML and Web Dynpro ABAP user interfaces cannot be guaranteed to work on mobile devices – there are just too many variations in how individual apps have been written. If you use this option with mobile make sure you test it thoroughly – and don’t be surprised if you hit a roadblock. An intent-based navigation is a semantic reference to a Target Mapping defined in the Tile Catalog for that app. It provides a default Open Task button in the task specific detail to launch the navigation target. NOTE: There is a particularly desirable variation on intent-based navigation if your target app is another Fiori (SAPUI5) app deployed on the same Fiori Frontend Server. You can embed the target app directly into the Task Detail area. Refer to SAP Note 2305401 – Integration of SAPUI5 Fiori Applications into My Inbox 2.0 for details and a very useful Cookbook guide you can download. 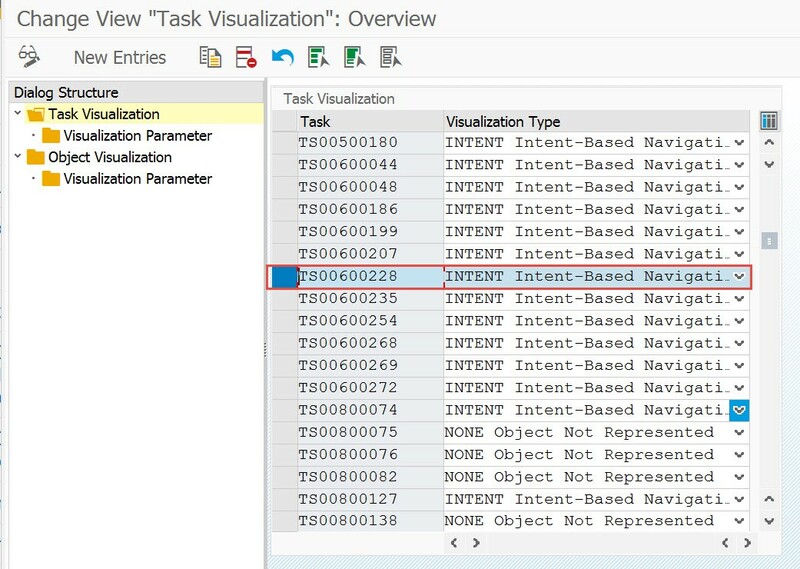 We know intent-based navgation is being used when there is a Task Visualization (transaction SWFVISU) entry of type “Intent-Based Navigation” (technically visualization type INTENT) configured in the S/4HANA Core system. This example is for Chemical approvals within the Enterprise Function Hazardous Materials Management. 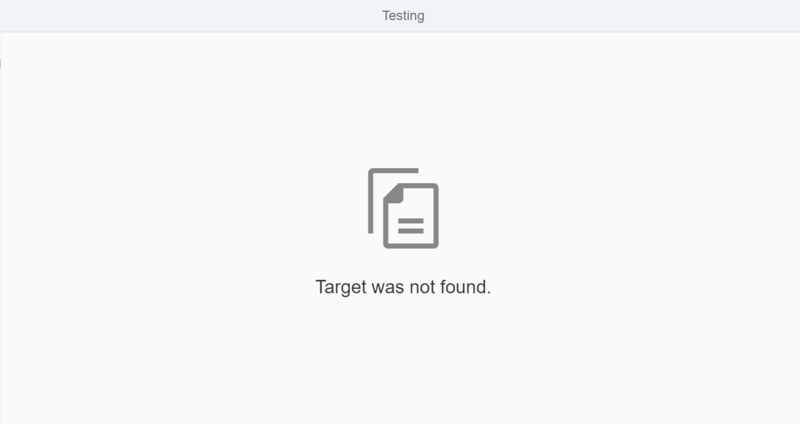 A matching Target Mapping must be defined in the Tile Catalog for the app, as in this example from the Target Mappings of Tile Catalog SAP_EHS_BC_HS_HAZMAT_MGMT. The target mapping defines the navigation target of the Semantic Object/action combination. In the example the target mapping for semantic object Chemical and action approve points to a Web Dynpro ABAP application. NOTE: As usual the system alias listed in the target mapping needs to mapped to the S/4HANA Core system in (transaction SM30) table maintenance view /UI2/ALIASMAP. If we want full control over the task specific display and behaviour then we need to use the Fiori My Inbox extensibility concept – just as in previous releases of Fiori My Inbox. This option supports all device types. If we want full control over the My Inbox display and behaviour then we need to use the Fiori My Inbox extensibility concept as described in SAP Note 2118812 – How to Extend SAP Fiori My Inbox Again, this works just as in previous releases of Fiori My Inbox. Make sure your My Inbox users have appropriate authorizations in both the Fiori Frontend Server to access the Fiori app and call the OData Service, and in the S/4HANA Core they need inbox authorizations as per sample security role /IWPGW/RT_WF_USR. Sure Anjan – as soon as it is released for customer usage. When you say “The newest option – currently only available in S/4HANA 1610 – is to extend the task specific details using an annotations XML file.”, the understanding is that the CDS UI annotations can be extended/ overridden using SEGW Vocabulary Annotations. Is that correct? Dose that mean, we can create a new Annotation Model for Referenced Service and add a few more annotation from Gateway side. And then specify the new Annotation Model URL in the visualisation parameter configuration. If that’s the case, then how are the CDS UI annotation loaded into the Gateway Vocabulary Annotation model? Or can we provide 2 or more annotation models in visualisation parameter configuration? 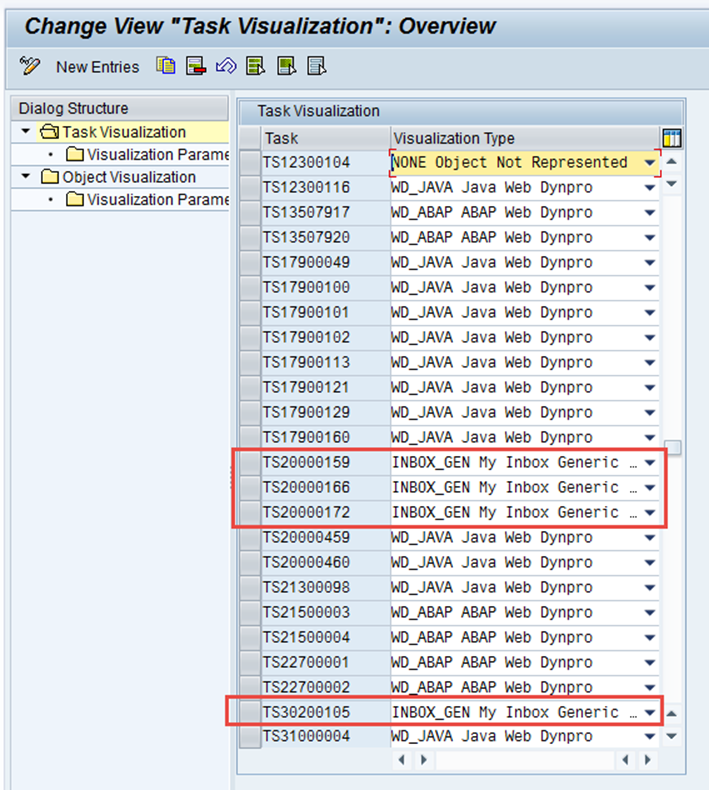 In S/4HANA CDS UI annotations can be extended using SEGW annotations – however typically we do not add anything else in the SEGW layer as per the Principle of One Archetype. It’s possible with e.g. Fiori Elements to add or override annotations with a local annotations xml as part of the Fiori app itself – that is a layering of annotations. The exact details and recommendations for how to use annotations with Task Specific options are part of what we are waiting for. It would be premature to discuss those details until that announcement is made. Just a bit of a provocation on your comment: “however typically we do not add anything else in the SEGW layer as per the Principle of One Archetype”. If you look at standard Fiori apps in S4 HANA like Material Documents Overview you will find lots of SEGW annotations. I was looking to build a similar list report and took me a while to find out that all the nice features like date picker were hidden in the backend service. So, there might be a reason for it, or would you recommend to avoid doing the same? Annotations have been added to historical OData Services, or occasionally complex OData Services that for various reasons may have been created in txn SEGW. However clear strategic direction is to create annotations in the ABAP CDS View via MetaData extension. Easy and efficient and maximum impact when reusing the ABAP CDS View in multiple apps. Second option for UI related annotations is to use the SAPUI5 app for the Fiori elements. Easy and great for overriding the default annotations in a single specific app e.g. when reusing the same CDS view for related apps. Putting annotations in the OData Service via SEGW is more of a fallback option rather than strategic. It works but it’s more effortful than using CDS. Thanks Jocelyn for the info. Would be interested to hear on possibilities of using annotations files/ paths for Task Specific configurations. As would we all… I keep asking periodically. We are using this in S/4HANA already. It’s more a matter of it being officially released for customer use. A small update – currently there is some discussion internally whether to adjust the approach to e.g. use the standard annotations for Object Page instead. Until this has been resolved we don’t expect the inbox annotations to be released for use. Currently i have a situation where the work item can be display properly in my inbox fiori. I also have made some entry in the SPRO to put WF iD, STEP ID, etc for my decisions step, and the approve and reject button has Green and Red colors respectively. Up to this point I think all the setting are seemed corrects. The problem is when I approve the work item from My Inbox FIORI, it does not seem to trigger the WF, and the work item still there in My Inbox FIORI as well as in SAP Inbox. But this case is never happen when I approve the work item from SAP Inbox, where the WF is properly triggered. Do you have any idea about this? how to trigger the WF from My Inbox FIORI? Ok so if your work item is actually a User Decision task the decision is passed automatically as an answer. However if it’s any other type of work item, you need to implement the related BADI and add some code to do the equivalent update of whatever your work item would usually update. What’s happening is the button pressed is being provided to the BADI – but because your not actually hitting the button in the *original* task in foreground, you need to add some code to the BADI to make the equivalent change in the background. Try the blog and give it a go. I implemented My Inbox – Approve Purchase Requisitions. Dynamic tile shows correct number and number of items in list is correct, but when select one item not show nothing of information in detail screen (only number and title). Hmmmm… nasty! That should not happen. I’ve seen it working fine… it may be a language/translation issue or just a regular common or garden bug. You’ll need to know your S/4HANA version as a minimum. It also helps to be able to check what support components you are on in your Fiori Frontend Server. If you still can’t find anything just raise a SAP Incident. Good luck and let us know how you fixed it when you find the answer. Thanks for this blog. We’re at the moment experimenting with activating the fiori myinbox, from my understanding the fiori myinbox should work the same way as the sap business inbox, however we found out that something standard like advance with dialog is not working, is this something that will be fixed in the future, or is SAP expecting us to rewrite multiple stringed workflow tasks into 1 all encompassing task. AFAIK UWL never did Advance with Dialog … and there’s no promise of that in Fiori My Inbox. Advance with Dialog was mostly standard in SBWP where you are in a stateful (rather than a stateless) environment. Thanks for the wonderful blog! We are planning to use the standard (retrieved from fiori apps ref library) fiori my box without any customization. Is it mandatory to implement BADI for the standard my inbox and workflow scenarios? For example, there is a standard my inbox already available in the fiori apps library for My Inbox – Approve Supplier Invoice. Do we still need to implement the BADI if we want to use this standard inbox or just following the implementation information mentioned in fiori apps library is sufficient? If there’s a sub-app for My Inbox available such as My Inbox – Approve Supplier Invoice – you are always better off implementing this first. Often they come with a predefined implementation of the BADI to save you having to create one. Is it possible to use My Inbox for other SAP objects. I wanted to test it for SAP PM notifications and PM orders. I have activated WF for PM notifications and in the backend all is working fine. I get task TS00008314 and I am able to process it. I am not able to see it in fiori app My Inbox. I have created entry in “Scenario Definition”. My inbox in configured to see all items. Do I have to creates also entry in SWFVISU?. I am able to see i.e. PO approval item in My Inbox. We are using S4 1610. Yes my inbox will work for all work items of SAP Business Workflows. You need to create an entry in SWFVISU to control how the work item is actioned. It should show up anyway though. Check it is actually a work item and not a notification item – we do not show notification items in My Inbox. You will only see it in My Inbox if the work item has not yet been processed of course. Once the work item is processed it disappears from all inboxes and goes to the outbox. If you are still having trouble with your configuration, please Post a Question in answers.sap.com with tag SAP Fiori for SAP S/4HANA. And add some further details – e.g. screenshot of your config. We’ve been live with MyInbox 1.0 for some time. We had removed the mass action ability initially. We’d like to enable it, but would like mass action available for only certain tasks. Is there a way to control which tasks you can take mass action on? I’ve been unable to find anything in notes or blogs. Note 2131722 seemed to indicate there was an issue with actions being take on tasks that were not mass enabled, but doesn’t indicate how you control that at a task level. Otherwise if your users select work items en masse, but there are no mass actions for that task, they will not see any options. If you have further questions please raise them in https://answers.sap.com as per the SAP Community Rules of Engagement. Please understand we can’t address detailed issues in blog comments. After configuration of My Inbox 2.0 Approve Requisition app is working but comments entered at the time of approval are not shown at next approval step in My Inbox App. I notice there are a few SAP Notes about issues with comments in Fiori My Inbox when you search on component CA-INB-FIO with keyword comments such as note 2508104. If you do want to raise a further question on the SAP Community please do that at https://answers.sap.com as per the SAP Community Rules of Engagement. Please understand we can’t address detailed issues in blog comments. I am sharing your blog content to my friends and colleges.. Great work. Very nice blog post. My use case is the opposite of what you describe – we have a complex SAPUI5 Task Interface where data must be filled in this is integrated as external and therefor we want to hide the Decision options in the details page in order to only complete the task from within the task user interface. However, if no decision options are maintained as described by you and the linked sap notes, the default decision value texts from the workflow step are added as neutral buttons. How can the decision options be hidden from default my inbox for specific task types? In my opinion a my inbox extension for this simple requirement would be too much overhead…. That’s an alternative to using the decision options so it replaces them with the appropriate options depending on how you have configured the navigation. Check for SAP Notes on this though… I’,m aware we’ve had a couple of issues with the embed option so make sure you have your inbox patched up to the best possible state. I was trying to bring my own annotation in Task-specific Annotation. I did as per your blog, but it is showing blank page. So I have few doubts to find the solution. 1) COMPONENT_NAME : If I am using my own component, I have to use the same “cross.fnd.fiori.inbox.annotationBasedTaskUI” ? Or If I have to give my own component, which path I have to give? 2) When I debugged in browser console, I saw the data is coming from CDS view. But screen is still blank. Then I have navigated to other item and clicked the same task again. Then it had 2 batch request and One value request. But for other items, it is showing 3 batch request. Whether there is something wrong in my config? Is there any document/reference for this issue? Whether this issue is in my side or should I raise incident to SAP? We currently do not recommend or provide support for using task based annotations for custom developments. The preferred option for custom developed apps for tasks is to use task-specific intent-based navigation. This is partly due to some thoughts around how My Inbox itself may change in future, as well as greater consolidation and clarity around how annotations are used generally across all Fiori apps. Using task-specific intent-based navigation also gives you much greater freedom in the task display than can currently be supported with the my inbox use of annotations. Hope that helps clarify things. This helped us to take decision for custom development. Now we decided to follow task-specific intent-based navigation for our requirement. Also I have another question. But in the application I am getting these value as null. Is there any way to get proper values Instance ID? I saw this value is available if I read this.getRouter()._oRouter._prevBypassedRequest. But wanted to check which one is the properway. We installed S/4 HANA 1709. We have a custom workflow for PO approval and upon installing the MyInbox fiori app, we could only see the header details of the PO (well, not really..). Line item details are not present. We had approached SAP support and was told that we have to use the standard workflow in order for the MyInbox to work properly. Is this true? FYI : I developed custom UI5 report using List Report Template from CDS Annotations. First of all, thank you for this great blog.